This Thanksgiving, in dining rooms across America, the turkey will be smaller, the stuffing more meager, the pumpkin pie sliced thinner. Gratitude will be given. But roiling just below the surface, for far too many families, will be economic anxiety. The vast majority of working Americans haven’t seen a real raise in 35 years. Meanwhile, every year, their health care costs rise. Their employers eliminate pensions. And their kids struggle with rising college or technical school tuition and debt. Workers worry whether they will ever be able to pay the bills. By contrast, on the other side of the Macy’s Thanksgiving Day Parade, the richest 1 percent are supersizing their feasts. For example, three families will spend $45,000 – each – for Marie Antoinette-style meals, gold flakes and all, at the Old Homestead Steakhouse in New York City. That’s up by $10,000 from the restaurant’s Thanksgiving fare for eight last year. It’s more, for one meal, than the average American worker earns in a year. 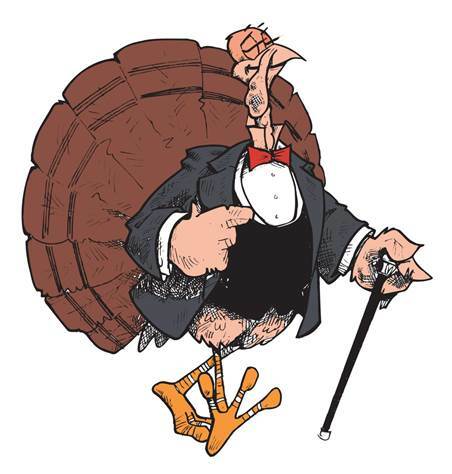 The 1 percent can spend $45,000 for a Thanksgiving supper because they’re gobbling up virtually all of the income from workers’ productivity increases. And now they’ve launched a new assault on workers. It’s a lawsuit called Friedrichs v. California Teachers Association (CTA). The 1 percent hopes it will prevent public service workers like teachers from joining together to collectively bargain for better wages and working conditions. If the $45,000-Thanksgiving-dinner crew wins the case, they’ll go after private-sector labor organizations next. They intend to gorge themselves until there’s nothing left for workers. This is what a $75-a-pound turkey struts like. The Marie Antoinette $45,000 Thanksgiving includes two turkeys. Because when would one, 20-pound free-range, organically raised bird at $75 a pound ever be enough? The Friedrichs case is about power. Individual workers don’t bargain for raises with gigantic multinational corporations and government agencies. They beg. But when workers band together and seek raises as a team, they gain for themselves the power necessary to negotiate. That’s intolerable to 1 percenters. And that’s why they’re backing the Friedrichs case – to seize that negotiating power from workers. Defending their right to collectively bargain are public service workers ­– the likes of firemen, teachers, social workers and public health nurses. The labor organizations these workers belong to try to ensure that they receive living wages and decent retirement benefits. But just as importantly, public service workers also use their collective voice to negotiate in the public interest, including improving response times for paramedics and lowering social worker caseloads to allow adequate time to investigate child abuse allegations. Public school teachers, who spend an average of $500 a year out of their own pockets for classroom supplies, routinely bargain to secure the smaller class sizes that parents want, to protect the recess breaks that elementary students need and to preserve arts and music education. In addition, significantly, a study last spring showed that more than half of teachers have used their own money to help students experiencing crises, to get them clothing or to feed them. The Marie Antoinette $45,000 Thanksgiving includes gravy made with Pappy Van Winkle bourbon, which goes for $4,900 a bottle. Because when would $9 worth of cooking sherry ever be good enough? The paychecks of all workers are on the line in the Friedrichs case because if the 1 percent succeeds in stripping rights from public service workers, it will go after those of everyone else. This creates great economic risks, not just for union members, but for non-union workers and their children. As it is now, a union member earns, on average, $200 more a week and receives better benefits than a worker who is not in a labor organization. If the 1 percenters succeed in robbing private sector as well as public service workers of their bargaining rights, then the wealthy will gain clout to eliminate that union advantage and eventually to suppress all wages. When union members lose, all workers lose. That’s because their ability to secure better wages pressures employers whose workers aren’t organized to raise their pay too. In addition, a study released earlier this year showed that the children of union members as well as the children of non-union members who live in high union density communities experience greater upward mobility. That means entire communities benefit from the work of labor organizations. And entire communities would suffer if the 1 percent can weaken or destroy them. The Marie Antoinette $45,000 Thanksgiving includes whipped sweet potatoes festooned with $1,600-an-ounce Royal Osetra caviar. Because when would the red-light-special, $115-an-ounce can of fish eggs ever be acceptable? Providing the big bucks to push the Friedrichs case is the Center for Individual Rights (CIR), which is bankrolled by 1 percenters and right-wing organizations. Its name is significant. It wants to isolate workers, render them individuals rather than members of teams acting concertedly to win benefits for all. The name of the group opposing CIR is noteworthy as well. It is America Works Together. It supports workers’ right to jointly seek advancement of all members of the group. Of course, labor organizations like the National Education Association (NEA), the Service Employees International Union (SEIU), and my union, the United Steelworkers (USW), are members of America Works Together. But the coalition also includes civil rights, faith, legal and health organizations. Among them are the Alliance for a Just Society, Coalition on Human Needs, Interfaith Worker Justice and The Main Street Alliance. America Works Together is an alliance of alliances advocating for the right of American workers to form alliances. It’s a symbol of the idea it supports – that community creates power. The Marie Antoinette $45,000 Thanksgiving final course is pumpkin ice cream decked with 24-carat gold flakes and a $4,200 bottle of private reserve rum-infused eggnog sauce. That’s dessert for the 1 percent. The 99 percent is seeking just deserts before the U.S. Supreme Court so that workers will retain the right to organize and collectively bargain for wages that will enable them to provide not a garish Marie Antoinette meal but a simple Norman Rockwell Thanksgiving for their families.